The Seminole County Sheriff’s Office Community Foundation is a non-profit 501(c)(3) organization designed to provide assistance to the county’s underserved and at-risk populations through education, prevention and resources. The Board of Directors is appointed by the Sheriff and comprised of members of the community and the Sheriff’s Office. Each year the Seminole County Sheriff’s Office joins with the Boys and Girls Clubs of Central Florida to help students in need prepare for the new school year with confidence and increased self-esteem. Our annual “Shop with the Sheriff” event begins with a breakfast donated by restaurants, followed by a trip to a local retail store where the children are paired with Sheriff’s personnel and shop for critical items such as shoes, uniforms, and clothing. The experience provides an important mentoring opportunity, and helps children see deputies as positive role models and friends. Want to help? 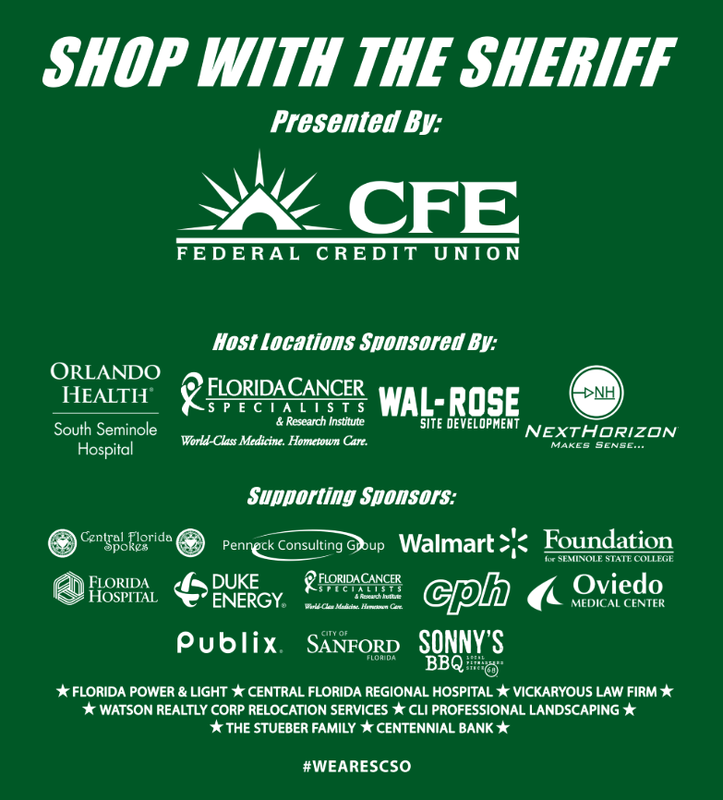 Our 2019 Shop with the Sheriff is scheduled for early August. Donations may be mailed in or made here online. The Foundation also joins with community care providers and local business partners to host a “Christmas Village” each December to help provide a brighter holiday for children in foster care as well as those who have faced abuse or neglect. Volunteers secure donations and raise funds to obtain thousands of toys and then set up a festive Christmas Village, complete with games, cookie decorating, crafts, and visits with Santa. While the children enjoy the activities, their parents and caregivers secretly shop for toys, which are then hidden in car trunks to be transported home for Christmas morning. Last year alone, more than 400 children participated in the event and had a brighter holiday as a result of the community’s care and support. Community members and businesses are encouraged to participate by having a toy drive, making a toy donation, or giving monetary donations. Another way to help is to sponsor a specific activity, such as the craft or cookie table, or the bounce houses. Sponsors are publicly acknowledged during the event through signage and announcements. Several hundred volunteers are also needed to help with the event. Interested in making a donation or giving your time or talents? Our 2018 Christmas Village will take place in early December. Learn how you can help here. In November 2016, The Community Foundation extended out support to the Police Athletic League. The following programs focus on providing safe recreational activities for youth while building positive relationships between youth and law enforcement. These programs offer low cost, safe and supervised activities to youths during Seminole County Public Schools Spring and Summer breaks. We have limited spots available for our camps, so register early! In an effort to bridge the gap with youth in our communities, the Elite Ladies fill a community need for mentoring for at-risk females within Seminole County. It is our goal to reach at-risk females within the community to reduce the risk of criminal activity while positively impacting their lives. Our basketball and boxing programs provide outreach to Seminole County youth, develop basketball and boxing related skills, improve physical fitness, positive interaction with law enforcement and develop important life skills such as self-discipline while improving self-esteem and confidence. Sheriff’s Cadets are trained in law enforcement operations and have the opportunity to tour Sheriff’s Office facilities and see demonstrations from a variety of Sheriff’s Office specialty units. The Explorer program is co-sponsored with the Boy Scouts of America Police Explorer Program and promotes community service and law enforcement career exploration through training and hands-on interaction. Explorers are trained in arrest techniques, leadership, crime scene investigation, traffic control, fingerprinting and enforcement procedures. Please note that donations made through PayPal incur a charge of 2.2%, plus a .30 transaction fee netted against the donation. REGISTRATION #CH43137. A COPY OF THE OFFICIAL REGISTRATION AND FINANCIAL INFORMATION MAY BE OBTAINED FROM THE DIVISION OF CONSUMER SERVICES BY CALLING TOLL-FREE (800-435-7352) WITHIN THE STATE. REGISTRATION DOES NOT IMPLY ENDORSEMENT, APPROVAL, OR RECOMMENDATION BY THE STATE. Join our mailing list. We’ll keep you informed of our news and events, as well as opportunities to get involved. To learn more about the Seminole County Sheriff’s Office Community Foundation, contact us at (407) 665-6748 or email Foundation@SeminoleSheriff.org.